Published by Rhea Anastas and Yale Union. Edition printed on Canson Infinity Rag Acid Free 310 GSM. Designed by Geoff Kaplan with R. H. Quaytman. This is one of two publishing projects with R. H. Quaytman and Orchard Gallery. The other may be viewed here. This publication, Orchard Spreadsheet 2016, is immediately apprehended as one thing overall, an Excel spreadsheet, and less immediately as what the artist R.H. Quaytman calls it: a landscape, one Agnes Martin might have made had she also been a certified public accountant. 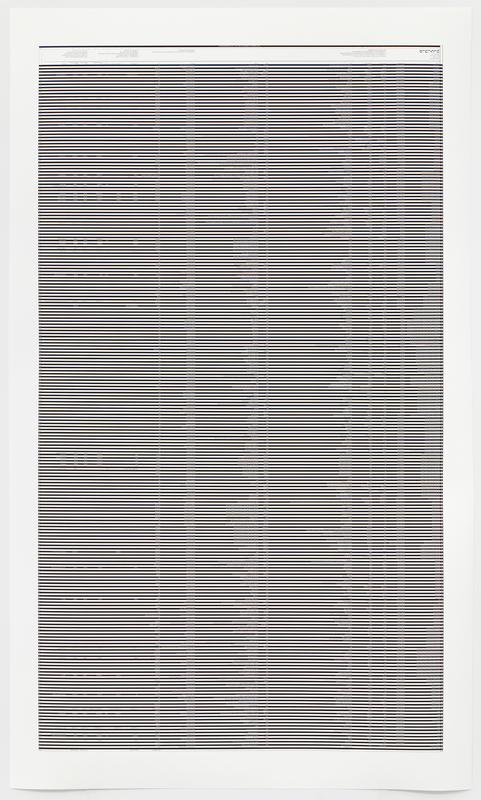 Where a Martin grid evokes geometry and planes of serenity, Orchard Spreadsheet 2016 evokes the stabbing optical burn of financial data, as it reveals the fiscal reality of Orchard, a twelve person co-operative gallery located at 47 Orchard Street, on the Lower East Side of New York City. Quaytman, the gallery’s director, released the first spreadsheet after only a year in business, and when Orchard went out of business three years later in 2008 (as had been planned), she distributed its exhibition program and financial records in a second public spreadsheet, keeping intact the gallery’s intent to trouble itself over without imposing on its subjects anything more than the real predicament they found themselves in. This distributed record is largely what connects Orchard Spreadsheet 2016 to its precedent Orchard Spreadsheet (2009). Part candor and part hallucination, Orchard Spreadsheet 2016 publicizes the gallery’s financial health and charts the basic fiscal responsibilities of its members. The spreadsheet registers all artists and artworks exhibited, followed by whether or not the individual work sold and what percentage of that sale went toward Orchard’s operating expenses and how much commission was earned for the seller and the artist. Sales were infrequent; not a farce, but outright financial success was never the goal. The goal was to seriously weigh the market, to learn more about it by taking part in it and to demystify it in the process. The fact that Orchard was in the business of making a public program and selling art does not mean it slipped into the market with ease or accepted the mechanics and its place within them. By running an audit, Quaytman negotiated conflicting positions, that of dealer, of artist, of secretary, and of a participant who adjusts art history from an artist’s perspective. The print’s black and white stripes bar our ability to see or are our ability to see. They redact something, though we can’t say exactly what. Certainly, they make it hurt and do not afford easy legibility. Vertical lines and cells seem to add another ghostly drawing generated not by the grids regularity but rather from the contents or from the type itself. It seems Quaytman’s way to edge the veil and veiled into some confrontation—to suggest in-distinction between the two, between abstraction and representation. As in the earlier spreadsheets, the information is oriented backwards reading from right to left. This Hebraic convention recalls the Jewish history of the neighborhood and the storefront itself which functioned as a minion before Orchard moved in. In the figures of Orchard Spreadsheet 2016, there is a tallied appreciation among Orchard’s members for an argument in art, a back and forth between support and doubt, laughter and annoyance. In it, we can find Orchard’s relationship to itself and its members, and their mutual need to test what they were doing against good strong arguments—their own and some that had come before. Beyond the financial, there is also the wide social net and a loss of invulnerability you find in much public documentation and art-history. There are still questions to ask about Orchard’s commercial experience and the validity of its form of critique, and while the spreadsheet is a landscape of Orchard’s programming and financial past, it is also a way to raise money for a book of writings by Orchard gallery artists and their collaborators, the publisher, Dancing Foxes Press, a not-for-profit. With this publishing project, conditions of value and location are made concrete. An artist-run institution, Yale Union, is the partner publisher of this artwork whose sale, will be monetized by values that belong to an art market, values that pass over into the financial realities of nonprofit arts organizations and art publishing, but that are rarely talked about as such. If there is one overriding factor in the commerce of the art world, it’s that we often operate in an information black hole. Our ignorance is not total, but information is nowhere near adequate. Orchard Spreadsheet 2016, like all images, has illusory depth revealing and obscuring, which is perhaps something true to say about the problem of information: a gesture on one side troubles the other. The spreadsheet becomes a confluence of an institutional account and a resuscitation of Op Art. While these devices seem like polar extremes, we would argue their effects are somewhat consistent, moving the eye tensely between a phenomenological immediacy and a statistically mediated sense of time, place, and speculative finance. At last, these effects congratulate us on our great good luck in having some physical, perceptual problem with data and transparency. Unlike the file’s 2009 predecessor, this iteration seems more sure that any attempt to be transparent is still obstructive and partially abstract—no matter how honestly the effort is undertaken. We have learned from the release of records that attempts to account can function somewhat unexpectedly as their own form of cover and even censorship. The optical burn of these numbers and letters animates perhaps the opaque limit of fiscal transparency, forcing these forms of data into their rightful place in the history of geometric abstraction. Transparency, we’ve come to think, is the magic power of imposing on the eyesight of spectators, so that within the appearance of an object, truth is equally near and far. Complicity and antagonism too. Hovering around the fact of transparency is Quaytman’s subservience and aggression towards the act, which she has framed on the other side of pedagogy. Not ironic or clinical or coldly “aesthetic,” in our view—Orchard is nobody else’s puppet—but nonetheless Quaytman seems suspicious, and her print sutures visibility with camouflage, transparency with myopia, favoring a squinted view over reading, optics over ledgers, popping us viewers into a hard squint. The patterns have a personality, a will. Lamented is irretrievability. That what once was lost congeals into an allegory of its own demise. R.H. Quaytman is an artist and cofounder of Orchard. She lives in New York and Guilford, CT.
Geoff Kaplan (General Working Group) is a graphic designer who also teaches. Kaplan lives in San Francisco. Rhea Anastas is an art historian, critic, curator, and cofounder of Orchard, now living in Los Angeles. This publishing project was organized by Rhea Anastas and Yale Union. Thanks to R. H. Quaytman, Geoff Kaplan, Miguel Abreu, Hope Svenson, Robbie Dewhurst, Jeff Preiss, Damien Hennessy, Karen Kelly and Barbara Schroeder (Dancing Foxes Press), Shannon Ebner, Cameron Rowland, Andrea Fraser, Peter Mundwiler, Christian Alborz Oldham, and Katherine Pickard.